Fingers feeling nimble? Fingers feeling flexible? Twist, stretch, turn, and tie your fingers in knots to solve these fun puzzles! Are your fingers up for it? 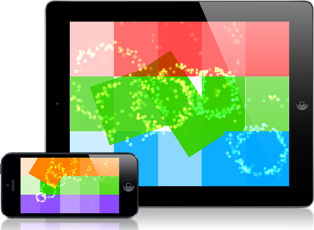 Finger Tied is a multi-touch puzzle game, only for the iPad. Finger Tied Jr. is for iPhone/iPod touch. In each Finger Tied puzzle, fill in a shape by moving up to four fingers around on your iPad at the same time. But be careful, lift a finger, or go out of bounds, and it's game over. Finger Tied will test your mental, as well as your finger abilities! Finger Tied can be played entirely by yourself, but for even more fun, invite some friends over and Finger Tied makes a great party game! "App Store Best of 2012: New Ways to Play"
"A must-buy for anyone with ten fingers and an iPad." Baby's Musical Hands is an award-winning musical toy for babies and toddlers for iOS and Android phones and tablets. As a game designer and developer, I love my iOS devices. But as a new father, I realized how much my son loves them too. I decided I could put my experience developing for iOS to use, and build an app for my son to play with. Baby's Musical Hands was born! Follow our blog to keep up-to-date on all the latest Streaming Colour development news.